In the heart of the NFL playoffs, I am always asked questions about Alabama Crimson Tide’s head football coach Nick Saban. Why not? Every kid who has signed with Alabama since Saban took his talents to Tuscaloosa has won a national championship. All Saban needs to do is wear those rings when he walks into a recruit’s living room. On game day, Saban knows when he walks on that field he has better players than the other team. He is a phenomenal coach and amazing at recruiting. But this recent championship will be remembered most for his decision to change quarterbacks trailing 13-0. Saban just a little over a week ago inserted a freshman quarterback at the starting position in the second half of a College Football Playoff national championship game. The freshman quarterback Tua Tagovailoa, who had played mostly clean up duty this season where he totaled 10 TDs. Came off the bench to trigger a comeback and threw a 41-yard touchdown to freshman wide receiver DeVonta Smith that gave No. 4 Alabama a 26-23 overtime victory against No. 3 Georgia in the College Football Playoff national championship. Tagovailoa entered the game at halftime, replacing a struggling Jalen Hurts. The “Twitterverse” went haywire. But Tagovailoa was cooler than the other side of the pillow, going 14 of 24, 166 yards passing and threw three touchdown passes to give the Crimson Tide its fifth national championship since 2009 under coach Nick Saban. 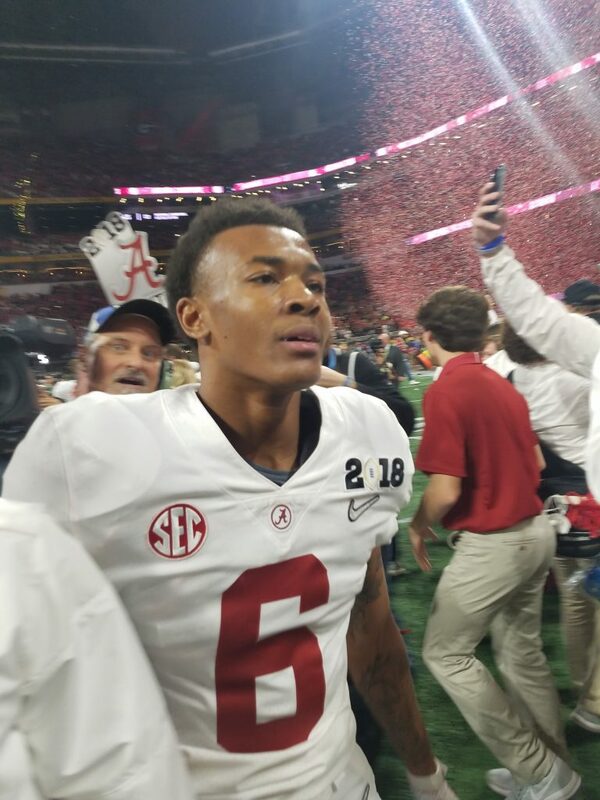 “It just felt like another game out there,” Tagovailoa stated. “I just thank God I was put in a place and position that I am in now. I just want to enjoy this win with my team and my family. Alabama was voted No. 1 in the final AP college football poll for the 11th time, three more than any other program. Players make big plays in big-time games moreover 75 percent of the game is recruiting. That’s why Saban is the best. Crimson Tide with the possession. Tagovailoa took a terrible sack on Alabama’s first play, losing 16 yards. Importantly, taken out of field goal range. In the huddle, the next play called was “Seattle.” The winning play was, basically, four receivers going deep. Three by one formation running four verticals. Georgia was playing Tampa two on defense. The corner should have rerouted the receiver, and the safety over the top played to tight on the slot receiver. Allowing Tagovailoa to throw the ball finding Smith, another freshman, and hit him in stride for the national championship. Jake Fromm threw for 232 yards and a moment looked as if he was going to be the freshman star of the game, the first true freshman to lead his team to a national title season since Jamelle Holieway for Oklahoma in 1985. Legend has it, Fromm was committed to Alabama then left to Georgia following head football coach Kirby Smart to Athens. However, Alabama did not shed a tear expecting Tagovailoa to take his talents to Alabama since they knew his preparation for the game was unlike no other and an unbelievable talent. Georgia’s defensive plan was good except the safety on the last play. The Bulldogs played conservative on the offensive end and threw the ball less. The first half was a terrible game for Alabama. There was barely any first downs; the defense played great. However offensively they were not blocking anyone in the first half mainly defenders coming off the edge. That’s why Saban is the best, not to take away from his coaching. Saban had an extra month of practice leading up to the game and benefited. But their true freshman quarterback from Hawaii threw the game-winning play to a freshman wide receiver from northern California. Moreover, on the final drive, you have freshman players on the offensive line and a freshman running back. This does not happen unless you have established a program that can recruit nationally. Alabama has not been that program until that last few years.